Art knows no boundaries of race, color, creed or time. Manifestations of human imagination have existed since the beginning. It has been an integral part of our evolution, the development of our personality, and the connection to our higher selves. To explore the art of tribal communities is to watch their growth and expansion and catch a glimpse into what has inspires their souls. The Philippines are not only rich in natural resources but also a vast and versatile land of folk culture. The hardy mountain tribes of Northern Luzon and those in surrounding regions have some of the most unique and colorfully artistic traditions in all of the Philippines. Perhaps, the peaceful and meditative atmosphere deep in the isolated mountains is largely responsible for their highly creative artistry. Each island has distinctive and extraordinary traditions that have been passed down from generation to generation for centuries. Tattoos are an art form that are present not only in the Philippines but throughout Southeast Asia. It is believed that women tattoo their legs, arms and breasts to enhance their beauty. Men, on the other hand, tattoo their bodies to mark age, bravery, tribal seniority, and more often to underscore the prestige gained in headhunting expeditions. In certain tribes, it is claimed that some tattoos have ‘magical’ qualities. In these places, designs of scorpions, centipedes, snakes and boats are often repeated to reinforce ties to ancestors and their village while they are off on hunting missions or in transition to the afterlife. In a few regions, tattoos are considered curative for disease and even physical deformities. They believed that covering an unsightly birthmark or growth with tattoos would cause the scars to automatically vanish. Among the sun-worshipping tribes of Central Benguet, the tattoos come in exquisite patterns of curved and straight lines. Its designs are in indigo blue and are poked onto the breast and arms of the arts most passionate devotees. Tattoos differ in patterns, intention and interpretation throughout the tribes. In some cases, the full significance of a tattoo cannot be understood without viewing them in relation to the wearer’s ornaments and garments. Sometimes, large and elaborate tattoos completely take the place of clothing. 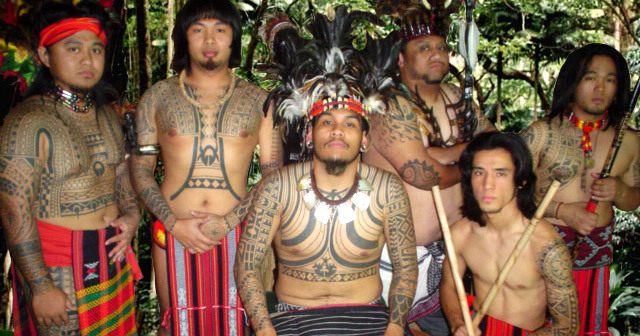 For instance, the Burik Igorots would tattoo their entire upper torsos giving the appearance that they were wearing a shirt. They say that without tattoos, they would be naked. Similarly, among the ‘Pintados’ (The Painted Ones) of the Visayas, it is customary to tattoo the whole body at a young age. It is believed that the sooner a child undergoes this tradition, the greater would be their capacity to endure pain and discomfort that would later help them in battle. 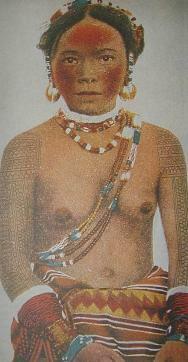 Because of the extent and rich elaboration of their tattooing, it was only necessary for the ‘Pintados’ to wear a strip of bark cloth or cotton in the manner of a G-string. The process of tattooing is an extremely painful ordeal. After the session, the tattooed area usually swells up for several weeks. The receiver of the tattoo can usually only endure short sessions thus taking several months before the entire tattoo is complete. The method of tattooing is more or less the same amongst all tribes with variations to the ingredients of the ink. The tattooist, usually a man, first smears the area that will be tattooed with a mixture of soot and sugarcane juice. Where no sugarcane was available, they use substitutes such as gall (bile of the gallbladder), lard, or hen’s excrement. He then pokes or taps the skin with a needle or pointed instrument in the design or practice of the tribe. Tattooing instruments vary from tribe to tribe. The ‘Pintados’, for example, would use sharp metal instruments that had been heated over fire. The Kankkanay tribe from Central Benguet would use a small piece of wood that they call a “gisi”. In Ifugoa, they would use an instrument made entirely of iron with two or three points on it. The Kalinga, in Northern Luzon, used a tapping device with five needles fastened to it. A very different and far more elaborate instrument called “ighisi” was used by the Isneg from the Apayao Province. It was fashioned in an ‘S’ shape out of rattan (a type of palm) with four or five pins attached to one end. During the procedure, the tattooist would continually beat the curve above the pins in order to push them deep into the skin.